The Welsh full back’s contract with the Top 14 side has expired. 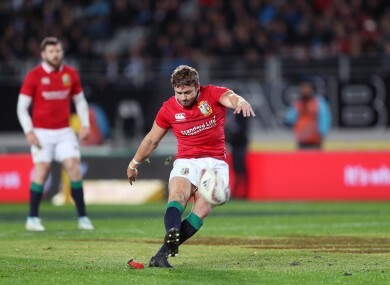 Halfpenny is currently in New Zealand with the Lions. TOULON WILL NOT seek to renew Leigh Halfpenny’s contract because of his international commitments, according to the French club’s president. Halfpenny did not play in the Top 14 final Toulon lost to Clermont because he was in New Zealand with the Lions. The absence of a key, goal-kicking player made an impact on Mourad Boudjellal’s decision not to renew the Welshman’s contract, which runs out this summer and which the club had previously expressed strong desires to extend. “The problem is the international rules,” Boudjellal told AFP. Halfpenny arrived at Toulon in 2014 and was a member of the team that won the European Cup the following year. Email “Toulon won't renew Leigh Halfpenny's contract for next season ”. Feedback on “Toulon won't renew Leigh Halfpenny's contract for next season ”.